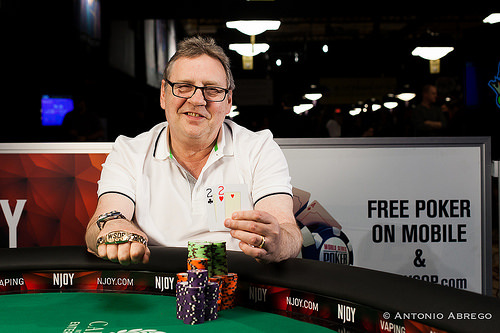 Gale's first bracelet came back in 2006 when won the $2,500 Pot-Limit Hold'em event. He won that bracelet one year after finishing runner-up in a Pot-Limit Hold'em event for his first ever WSOP cash. He becomes the first Brit to win a bracelet this year and sixth international player to win one. Last year the Brits earned just one bracelet, which was won by John Kabbaj in the O8/Stud 8 event. Joining Gale at the final table was fellow Englishman, Stuart Rutter. Rutter ended up being eliminated in fifth place by Gale. Gale then went on to knock out the remainder of his opponents on his path to the gold bracelet. "It is still incredible. I cannot believe it, I am over the moon," said Gale about winning a second gold bracelet. The first bracelet will always be special to Gale because it was the first, but winning the second one brought just as much excitement, if not more to Gale. Gale said that he has a full schedule of events planned for the duration of the series and that he cannot wait to get back on the felt. He hopes to play in tomorrow's $1k No-Limit Hold'em event and maybe earn himself a third gold bracelet. This is now the second time Gale has cashed at the 2015 series. Before these two cashes, the Rio has not seen much of Gale in the recent years. His last previous cash before this year was in 2007 in a $2,000 No-Limit Hold'em event. Now that Gale is back, expect to see a lot more of him and a lot of strong results from the two-time bracelet winner. When he was playing in the mid-2000s, Gale cashed in bunches, racking up eight cashes from 2005-2007. This turbo event featured 30 minute levels on Day 1 and 40 minute levels on Day 2. It is the only turbo event on the 2015 schedule. Earlier in the series there was a Hyper Hold'em event that featured even faster levels. That tournament was won by John Reading. Standard WSOP tournaments have 60 minute levels. This year’s turbo event enjoyed an attendance increase of more than 30 percent over last year. The 1,791-player field generated a prize pool of $1,611,900 that paid the top 198 finishers. Those to cash but fall short of the final table included all-time Circuit wins leader Alex Masek (188th, $1,821), Justin Zaki (132nd, $1,982), bracelet winners Brent Hanks (123rd, $2,192) and John Reading (46th, $4,948), Sorel Mizzi (104th, $2,192), two-time bracelet winner Chris Bjorin (101st, $2,192), Colossus third-place finisher Ray Henson (95th, $2,450), Wisconsin’s Joe Kuether (26th, $8,704), five-time Circuit ring winner Mark “Pegasus” Smith (21st, $8,704) and Adam Bilzerian (12th, $17,053). Day 1 of the event kicked off Sunday, June 7 at noon PT and by about 9:30 p.m., the field was in the money. Play wrapped a few hours later just after 2 a.m. with 29 players remaining. 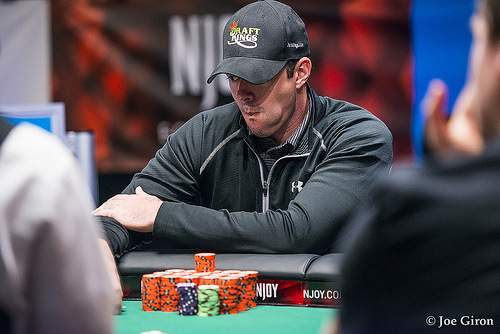 Day 2 resumed the following day at 1 p.m. and play concluded at around 10 p.m.
Gale’s official WSOP player profile page is available HERE. John Gale raises to 330,000 and Gary Luther moves all in. It takes a moment but Gale makes the call to give himself a chance for victory and the cards are on their backs. The board runs out . Gale wins, and he embraces his vanquished and gracious opponent to the applause of the crowd. Luther takes home $184,481 for second place. Gale wins his second WSOP bracelet and $298,290. Gary Luther moves all in on the button, and John Gale shakes his head a bit before folding his hand. John Gale calls and Gary Luther checks. The flop is and they check to see the turn and the river. Gale has for the win. Gary Luther limps on the button, and John Gale raises it to 345,000. Luther calls, and the flop comes down . Gale moves all in, and Luther quickly folds. John Gale calls and Gary Luther checks. The flop is and a 150,000 bet from Luther sees Gale call. The turn is the and Luther shoves. Gale folds. Gary Luther limps on the button, and John Gale checks his option. The flop comes down , and both players tap the felt. The hits the turn, and Gale checks to Luther, who bets out 170,000. Gale calls, and the river is the . Gale checks a third time, and so does Luther. Gale tables for two pair, and that earns the pot. Gary Luther makes the call on the button, and John Gale checks his option. The dealer fans out a flop of , and both players check. The hits the turn, and Gale fires 180,000. The completes the board, and Gale bets out 250,000. Luther moves all in, and Gale rechecks his cards before folding. John Gale calls and Gary Luther moves all in. Gale folds. Gary Luther moves all in on the button, and John Gale releases. John Gale makes it 250,000 and Gary Luther calls. The flop is . Luther checks and Gale bets to take it down. Gary Luther moves all in from the button, and John Hale gets a count. Once he gets the number, he releases, and Luther scoops the pot. John Gale calls. They check it down on . The of Luther takes it. Gary Luther raises all in, and John Gale flashes before folding. Luther takes the pot. John Gale calls on the button and Gary Luther checks. The flop is . Gale bets and takes the pot. Matthew Vessier bumps it up to 300,000 on the button, and John Gale moves all in from the big blind, easily having Vessier covered. Vessier makes the call, and sees he is well behind. The flop comes , and Vessier picks up some more outs. The on the turn means that Vessier can only win with a deuce now, but it doesn't come, as the completes the board. Vessier will have to settle for $127,549, and we are now heads up. Gale holds a massive advantage right now, with 8.06 million to the 905,000 of Luther. The players are taking a short break while the stage is set up for the heads up battle. John Gale opens for 250,000 and takes the pot. Gary Luther makes it 250,000 on the button, and Matthew Vessier three-bets to 650,000 in the big blind. Luther releases, and Vessier scoops another.